In this economic climate, many small businesses do not qualify for loans based on the standards imposed by banks and financial institutions. For fledgling businesses, the establishment doesn’t have enough cash flow, revenue or credit to qualify for a loan. Many times, entrepreneurs have to put up personal assets as collateral for loans, which can be problematic and risky. 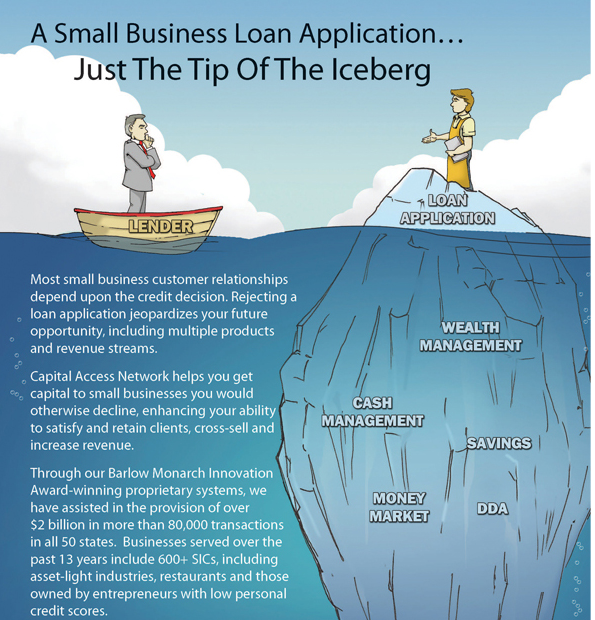 The fact is working capital is difficult to get from banks unless a business has perfect credit. Capital Access Network (CAN), a company that gives small businesses access to credit and working capital and helps solve the problem outlines above, is announcing this morning that it has raised $30 million from Accel Partners. As part of the transaction, Accel partner, Kevin Efrusy will join Credit Access’s board of directors, and Accel vice president, John Locke, will join as an observer. CAN constitutes the largest, non-bank alternative capital provider to small businesses in the US. The company uses its own real-time platform and risk scoring models to provide capital to small and medium-sized businesses in the US and Latin America and has funded over $2 billion in capital to SMB’s under the brands NewLogic Business Loans and AdvanceMe. This represents roughly 100,000 distinct small business finance transactions. This year alone, CAN will fund over $600 million in loans to small businesses. CAN uses a variety of data points to deem a business worthy of credit or capital apart from the traditional criteria. CAN’s proprietary underwriting algorithms will churn through its vast data stacks of historical merchant demographic, firmographic, psychographic and social and behavioral profiles seeking and seasoning new behavioral and synthetic risk indicators and recombining those indicators into new risk scorecards. Typically, CAN will give merchants and businesses anywhere from $2,500 to $250,000 in working capital. Customers range from medical practices, to shoe stores to auto repair shops to clothing, accessory and home product online retailers. CAN CEO, Glenn Goldman, tells me that the extra amount the borrower has to pay to CAN depends on risk of the loan, how long it will take for the loan to be paid back, the amount of capital lent and other factors. But he says many times, the amount CAN charges is less than any interest rate from a bank. And 75 percent of customers renew their funding. In some cases, repayment can be fairly simple. Goldman points to the example of one online merchant who chose to automatically forward a small percentage of sales from its payment processor directly to CAN to repay the loan every month. If sales were lower than usual that month, CAN would lower the amount needed to pay. And Goldman explains that behavioral risk scoring, rather than just examining a small business owner’s FICO score, allows the company to ‘yes’ to a higher percentage of SMBs than traditional sources while mitigating losses. Goldman says the new funding will be partly used for boosting and redesigning the online merchant experience on CAN. By April, the lender will feature new user interfaces, merchant portals and online approvals. As Efrusy explains, there’s a huge amount of disruption taking place in the online lending space, and CAN is in a great position to help small businesses grow with working capital. Kabbage is another startup that is also looking to provide capital to online merchants, and ZestCash is doing something similar on the consumer end of the spectrum.